This is my take on the occupation of an abandoned Federal building by an activist militia, in protest of US government land-use policies. NOT WRONG: By strict definition, all US government "property" is forcibly expropriated from human beings. It then uses funds forcibly expropriated from human beings to maintain its control of this "property". The US government "owns" something like half of the land within the nation's borders, and uses much of it for destructive military purposes, and for lease to mega-corporations at less-than-market rates. FedGov is no innocent victim. For a handful of citizens to to temporarily occupy a building unused by the inherently criminal FedGov is hardly a violation of anyone's "rights". Contrast this to Black Lives Matter which has destroyed millions of dollars of private (and government) property as well as causing human injury and death. BUT STUPID: As Alex Jones (among others) has commented, this is a matter of the activists not having chosen one's battles wisely. Most Americans don't understand the intricacies of the property rights battle in question here, and thus can easily by swayed by the mainstream media into believing the "official" government-sanctioned narrative. The activists will be very easy for the powers-that-be to use the general public against. If the activists had instead targeted land associated with the NSA spying apparatus in Utah, however, they might have brought attention to their land-use issues while staving off attacks from the activist Left. Apollonian/Libertarian: Pallas conjunct Mercury and Sun and parallel North Node. This puts the event chart somewhere between the Libertarian ("do not give in to evil") and Statist ("the end justifies the means") corners of the Axis of Good and Evil. Which is a pretty good reflection of using the anti-libertarian threat of force to achieve a libertarian end. That most of the major players here are in the Seventh House speaks to the fact that the action is solely intended to provoke an outside party (FedGov). The occupied building itself is not particularly important to either party. Jupiter conjunct North Node at the IC: the NN at the IC is (in the absence of significant mitigation) typically a strong "social conservative" placement. Add Jupiter for emphasis. 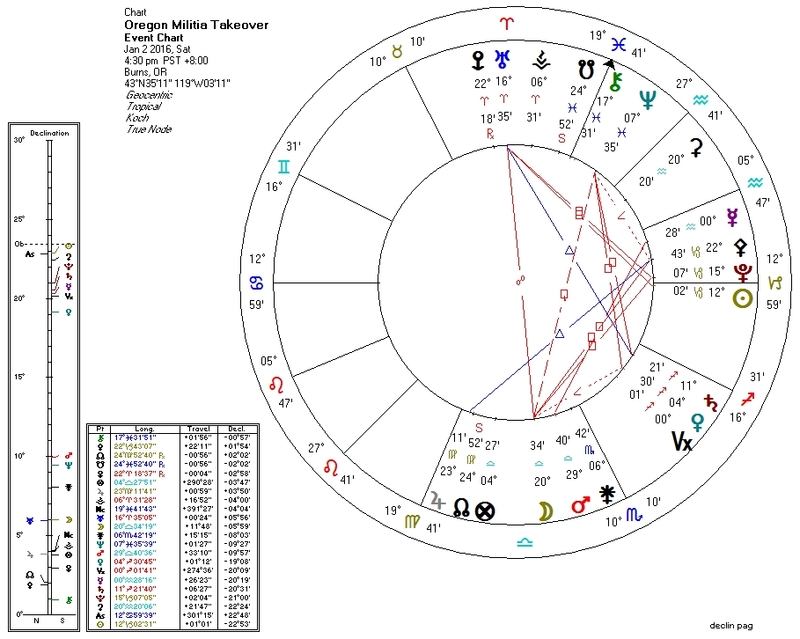 The Fourth House and Virgo connections here connect with "land use", and the Fourth House in mundane astrology often signifies opposition to the party in power. South Node and Chiron at the MC: Wounding and disempowerment of authority. Mercury in Aquarius square Mars in Libra in the Fourth: political speech jarringly implemented through social (Libra) action (Mars) regarding land (Fourth House). Venus conjunct Saturn in Sagittarius: struggle over the philosophy of property ownership. Uranus-Pluto-Moon T-square: rebellion/upheaval over land. Here's hoping the situation resolves without bloodshed.